For all those who missed me, I was extremely busy with first Christmas and then work. For Christmas, I decided to make a lot of our gifts, thinking that a homemade gift would be cherished and appreciated. That's a post coming soon to a blog near you. Then, we had our annual sales meeting in Miami this week and I am now heading to Grand Cayman for the weekend. Thanks for continuing to check in. Regular posts should be coming after I get back. Meanwhile, I am uploading a bunch today. Enjoy! There I was. Going to Miami. Flip Flops! Needed pedicure. Not much time. Left church, took off tights, threw on glittery blue flip flops and huge flannel coat. Went to nail salon in WalMart. Got pedicure. Proceeded to walk through WalMart. Me – They called me a chick! Hurray! Oh wait. They were making fun of me. I evaluated my outfit. Dressy clothes, flip flops, flannel coat two sizes two big. I could actually appear on peopleofwalmart.com!!!!!! But, don’t my toes look nice? As seen here in Miami Beach sand. Sorry, I was going for creative. How'd I do? i am scared to ask, which of those people were supposed to be you. 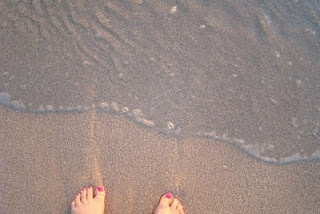 Sand, pedicure, what more does one need?